At my house baking season is about to kick off with a bang! Maybe it is where you live too. Well - If you would like to add a little magic to your holiday bake-a-thon be sure to order these fun kitchen coordinates from shopDisney.com. After all, a little Mickey makes everything just a bit more fun. 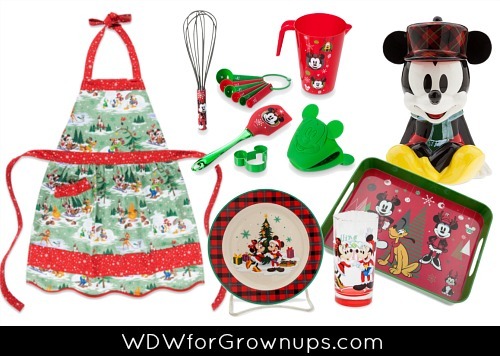 The Mickey and Friends Baking Set includes all the gear you need to get mixing up a batch of fun - measuring cup, baking spatula, whisk, measuring spoons, silicone pot holder, and Mickey Icon cookie cutter. My girls and I like to look cute while we bake, so we protect our clothes with aprons, and this Happy Holidays Apron comes with an adjustable neck strap and front pocket. Once your mission is complete you will need a place to stash the goods, why not use this Mickey Mouse Holiday Cookie Jar, or serve them up with a set made just for Santa. Will you be baking up something wonderful for the holiday season? Try this recipe from the Disney Food Blog to make your own Wilderness Lodge Magic Cookie Bars. Let me know how they turn out!